The North Carolina artist never put his sticks down—he decided, instead, to make a living off of them, sculpting more than 275 pieces around the world using site-specific saplings. Dougherty’s works are large, graceful and intricate, and today he brings his talents to Custer’s Meadow in Austin’s Pease Park, where he has started to construct one of his signature behemoths. 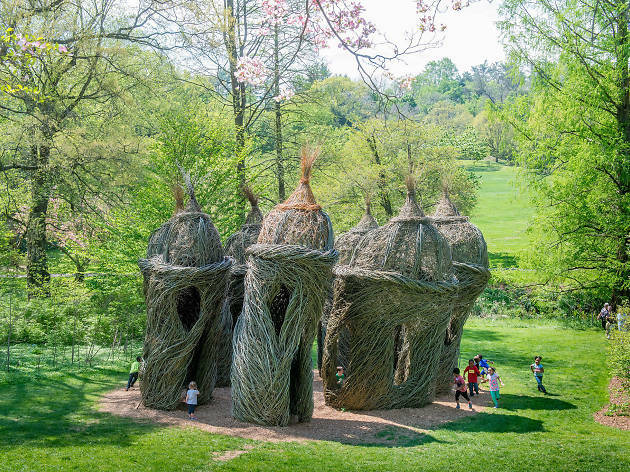 While many of Dougherty’s pieces exhibit similarities in structure—leaning huts are a common theme, as are vaselike towers—no two projects are the same. But when asked about his plans for Austin, he admits that designs aren’t solidified until he’s standing on his canvas—in this case, a park. “It sounds sick, but I come up with ideas very quickly, and the forms are simple. You have circles, squares, ellipses—it’s what you do with them that makes them relevant.” Certain conventions come into play, too: doors and windows and the occasional maze in which, the sculptor notes, you can lose your children for a minute. 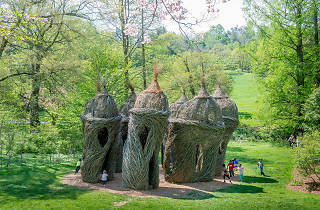 Of course, a sculpture made entirely out of saplings inevitably returns to its roots; Dougherty’s pieces have an average life span of two years. But the artist isn’t bothered by the inevitable decay. Dougherty's Austin sculpture is tentatively scheduled to open to the public on February 10, but you can catch the artist before then during a talk hosted by the Pease Park Conservancy on January 22 at the Dougherty Arts Center.